Our zero emissions, fuel cell plug hybrid vehicles all feature an aluminium chassis engineered by Lotus. The very efficient powertrain architecture combines the power capability of a lithium-ion battery with the energy capability of a PEM fuel cell to achieve excellent vehicle performance with ultra-low energy usage. 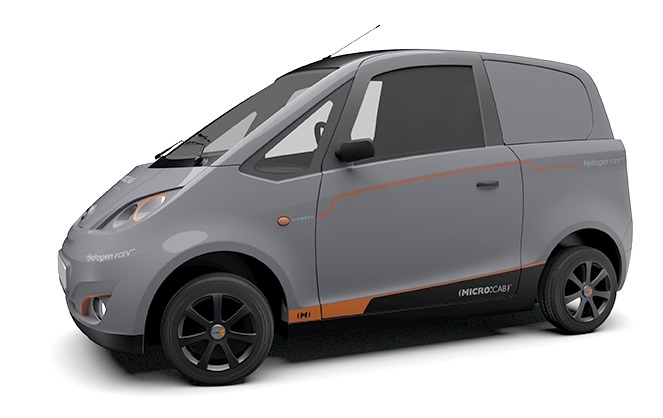 This multi-purpose H2EV Microcab can be used as a four-seat car, a light van (as shown above) or a taxi, and the plug fuel cell, dual fuel combination means that the battery pack can be recharged for short range with hydrogen storage and fuel cell for extended range. Click here to see an overview of hydrogen filling stations worldwide. You can zoom into the UK to see the locations of current and planned stations. Hydrogen is the lightest element, colourless, odourless and flammable. When hydrogen escapes into the atmosphere, it scatters immediately upwards so a hydrogen spill won’t pool on the ground, pollute groundwater or soak into clothing. Hydrogen is the most abundant element in the universe and the third most abundant on Earth (after oxygen and silicon), found in water and organic matter. Hydrogen fuelling station at Swindon.